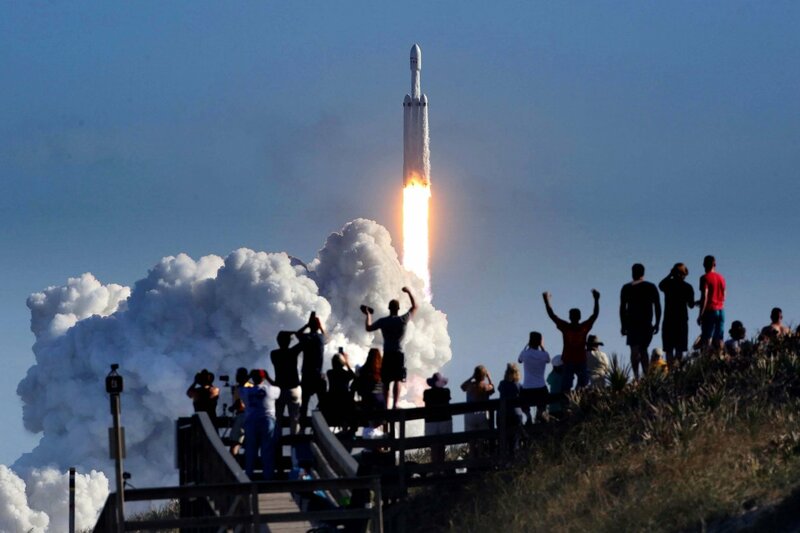 The launch of a SpaceX Falcon rocket in February. Staking out another bold space objective, Elon Musk said the latest configuration of his rocket is designed to fly as many as 10 times without any scheduled maintenance, and ultimately could be refurbished and blast off at least 100 times. Speaking Thursday before the first planned launch of an upgraded SpaceX Falcon 9 rocket, Mr. Musk spelled out his long-term vision of reusability, a concept he has pioneered to revolutionize space transportation. The mission from Florida’s Kennedy Space Center was aborted by a last-minute technical problem, but a second attempt was scheduled for Friday. Space Exploration Technologies Corp., as the company is formally known, already reuses the lower stage of its current-generation rockets, typically months after the first use. But starting next year, the company plans to use the same main engines and lower stage to conduct two consecutive missions in a single day, Mr. Musk said. Going further than he has before, he predicted additional advances intended eventually to make space travel as routine and safe as boarding a jetliner. When it comes to both SpaceX and electric-car company Tesla Inc., which Mr. Musk also runs, the billionaire has been criticized by auto-industry analysts and aerospace rivals for boasting about technical accomplishments while laying out super-ambitious goals and specific timetables that often prove unrealistic. Recently he clashed with Wall Street analysts over whether Tesla has the ability to ramp up production and resolve nagging assembly-line problems. Mr. Musk’s latest comments about SpaceX risk a repeat of that dynamic if the company fails to deliver. Over the years, the company has fallen short of goals to increase launch rates or complete new spacecraft on schedule. But instead of dialing back public projections, Thursday’s news conference highlighted Mr. Musk’s determination to continue capturing the limelight with increasingly ambitious goals. Extolling the latest Falcon 9 as “the most reliable rocket ever built,” the SpaceX chief went on to say he is certain his engineering team also “will achieve full reusability” of the upper stage, which now burns up “like a meteor” as it returns to the atmosphere. Falcon 9 rockets have suffered two catastrophic explosions since 2015. That has compared with no such failures involving rockets built by rival United Launch Alliance , a joint venture of Boeing Co. and Lockheed Martin Corp. , over a much longer period. If the reusability strategy succeeds, Mr. Musk held out the promise of cutting the price of orbital launches to $5 million or $6 million, from $50 million or $60 million currently. “That would be quite insane,” he said, though customers still would have to shoulder part of the development costs. But Mr. Musk didn’t explain when that could occur, or how such a drastic change in his business plan would still produce enough revenue to fund pending multibillion-dollar projects to develop a behemoth deep-space rocket and deploy thousands of small communication satellites. Throughout his typically brash performance, Mr. Musk reiterated the tenets of his ambitions for SpaceX. He aims to build a fleet of rocket ships able to transport humans to Mars, but flexible enough to operate at roughly the cost and frequency of traditional airlines. To move toward that goal, however, SpaceX first has to prove it can safely fly astronauts on today’s version of the Falcon 9. National Aeronautics and Space Administration officials are considering whether to approve putting astronauts in the capsule on top of the rocket while it is loaded with super-cooled fuel. Mr. Musk said the safety issue “has been somewhat overblown,” though for the first time he publicly said if necessary, “we can adjust our operational procedures” to fuel the rocket first.